A hospital suite designed to give parents a safe haven to stay in after the loss of a baby has been officially opened on the maternity unit at Worthing Hospital on Wednesday 27th February 2019. The Maple Suite offers a home-from-home environment with a private entrance away from the delivery suite, with its own delivery bed, bathroom, sofa bed, television and kitchenette. Joined by maternity staff, Love Your Hospital, the Trust’s dedicated charity and local families who had fundraised to support the suite’s development, the Mayor of Worthing cut the ribbon and expressed his heartfelt thanks to all involved. He said: “We are delighted to be able to open a space within our hospital’s maternity department and it is certainly lovely to see our local families assist with the funding of such a personal space and to see them here with us today. “On behalf of myself and the Mayoress, we hope that the families that use the space, albeit under emotional and upsetting circumstances, can find the suite homely and as comfortable as possible.”In 2017, one in every 225 births in the UK ended in a stillbirth. On average, nine babies are stillborn every day in the UK, making it 15 times more common than cot death. For parents, parting with a stillborn baby is the first step in a long and difficult grieving process. A device called a Cold Cot, also available in the suite, provides a temperature-controlled mat placed at the base to keep babies cool and allow parents to spend more time with them. Juliette Phelan, Maternity Matron for Worthing Hospital said: “Experiencing a stillbirth is so distressing for families and the staff involved. Our vision as a maternity team was to create a quiet, homely and dignified space to enable couples to spend quality time with their baby without being disturbed by the hustle and bustle of our busy labour ward. “Sadly, the room is in regular use, but we’ve already had some incredible feedback from families who have said it has made such a difference. Shelley Kyte, a Clinical Systems Trainer at Worthing Hospital, raised more than £3,500 with her partner Mark towards the suite in memory of their baby girl, Rosie, who was born sleeping on 11 June 2015. On what would have been Rosie’s first birthday, the couple completed a 100-mile run to provide funds for a new cold cot. Shelley said: “The day Rosie arrived was also the day our world came tumbling down. After her birth, we stayed with her for a while, but unfortunately could not stay the night which broke our heart. “We were surrounded by the sound of babies crying in the delivery suite and the happiness of other families as we left hospital without our angel. Brighton-based company, Paxton Access, where Shelley’s partner Mark is an employee, raised more than £4,700 towards the refurbishment. Paxton CEO, Adam Stroud, said: “A big thanks to Love Your Hospital and to the maternity department for all their support during this period. When Chris Sloggett’s son Jasper was born on 13 April 2017 at Worthing Hospital, both he and his wife Gayle were looking forward to going home and starting life as a family. However, after a relatively straight forward birth, Jasper became very unwell before they were discharged and stopped breathing while still on the ward. After being rushed to the special care baby unit next door, nurses carried out emergency tests and discovered he had a serious infection. Jasper spent two and a half weeks on the unit and further investigations found he also had an abnormal lump on one of his heart valves. It was this life-saving care that inspired Chris to raise money for the unit. No stranger to running, he had already taken part in no fewer than nine marathons already, however, this time round, he decided to take on the big one and embarked on a rigorous training regime to get ready for the 2018 London Marathon. Setting a target of £300, Chris was amazed to see the pounds roll in and within just 48 hours of launching his JustGiving fundraising page, he’d raised more than £600. With support from him running club, the Henfield Joggers, Chris ramped up his training getting up a 4.30am in the morning and clocking in five runs a week. On the day of the run, all Chris’s hard work came into its own when he crossed the finish line in 4 hours, 41 minutes and 42 seconds and a fantastic fundraising total of more than £1,560. Staff at St Richard’s, Worthing and Southlands hospitals got into the festive mood last week raising money for their local hospitals. Love Your Hospital has placed a Santa’s sleigh outside the Spice of Life restaurant in St Richard’s Hospital and the Penguin Foyer at Worthing Hospital for people who want to donate a present for a patient. Those interested in supporting the appeal should get in touch with the charity office for guidance on appropriate gifts to buy. 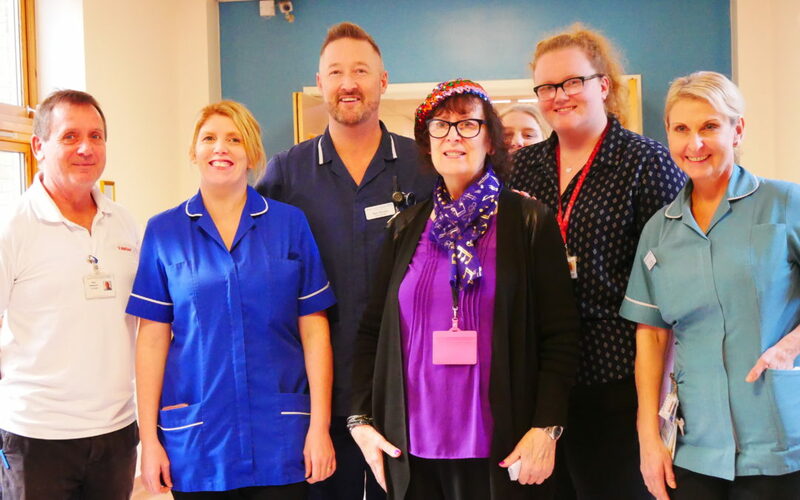 Frances Usher-Smith, Clinical Matron, said: “Many of our older patients are also living with a dementia and a visit to hospital can be a challenging experience. A donation to our Christmas Gift Appeal will help us to buy presents and make Christmas for these patients more pleasant. Love Your Hospital is also asking local companies to get involved by holding a ‘festive fashion day’ for staff to help raise funds on Wednesday 19th December. A nurse from Selsey has adorned the outside of her house and front garden in Christmas decorations to mark the launch of a local hospital charity’s Christmas gift appeal. Sarah Munday, 42, a dementia nurse at St Richard’s Hospital, has covered her place of residence with candy canes, reindeers, icicles and a 6ft Nutcracker figure to show support for Love Your Hospital, the dedicated charity of Western Sussex Hospitals NHS Foundation Trust. The Christmas Gift appeal is calling on the local community to donate online and enable the charity to provide presents for patients staying in hospital over the festive period. The Munday family, based in Marine Drive, have become known locally for elaborately dressing their house each Christmas and attracting a lot of attention. As part of the gift appeal, they’re asking admirers of their hard work to kindly make a donation in the red post box in the front garden to support dementia care. With the help of her husband, Ruben, 50, and daughters Lucie, 17 and Jennifer, 19, Sarah has put up so many festive lights, local fisherman claim to be able to see the decorations illuminating the night’s sky two miles out to sea. Love Your Hospital has placed a Santa’s sleigh outside the Spice of Life restaurant in St Richard’s Hospital for people who want to donate a present for a patient. Those interested in supporting the appeal should get in touch with the charity office for guidance on appropriate gifts to buy.